Within the framework of an educational trip to Berlin, the association Cselekvö közösség (“Active Communities”) lead by Dr. Mária Arapovics and consisting of local politicians and experts from museums, libraries, and NGOs met with representatives of various cultural institutions in the German capital. On the 25 September, the group visited ERIAC. 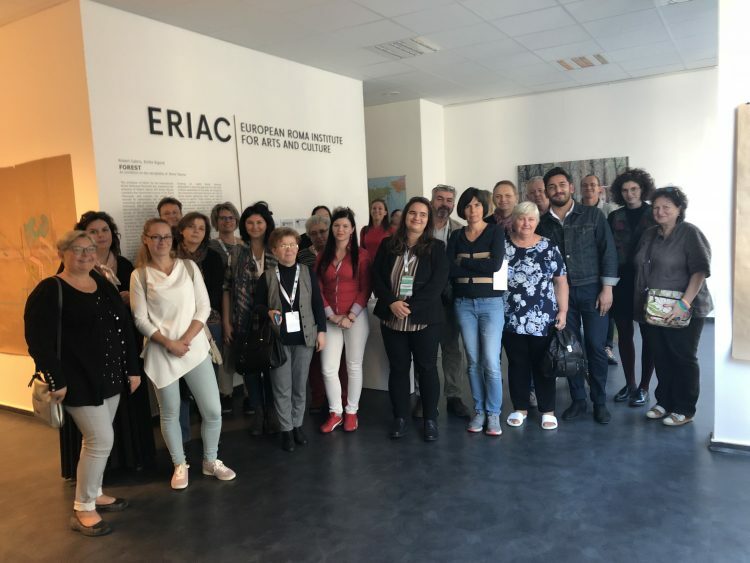 After getting insights into the history of the institution and an overview of ERIAC´s events and programme work, the participants were especially interested in learning about ERIAC´s past activities in Hungary, the contemporary Roma art scene, and practical aspects of working transnationally. After a lively discussion and an exchange of good practice, Almir Huseini gave a guided tour through ERIAC´s current exhibition “Forest”.